The Two Hour ZIP LINE TOUR Plus LUNCH: It’s a Winner! Check in at 11:30 for this 12:00 tour. Meet your guides and board the 6 ton Monster Truck or one of our Polaris ATVs, depending upon the number of guests who are scheduled. Enjoy the climb up almost 1,000 vertical feet from Base on winding trails through the Forest to some of the higher elevations on the Continental Divide. Guides will point out old mining ruins, close-up views of some of the highest mountains in Colorado including Mt. Elbert and Mt. Massive, and possible views of the resident elk herd. Perhaps you will see passengers departing from their ride on the Leadville Colorado & Southern Railroad on our property by the water tower. After a delicious box lunch from a local restaurant, guests will leave the Yurt to get their equipment and go through a brief flight training school. Accompanied by two Zip Line Guides, it’s time to step off the first platform in the cool mountain air, and JUST GO FOR IT. Fly side by side, race your families and friends off the sturdy decks. All lines have double cables for safety; this is HANDS FREE FLYING at its best. Our brakes are called ZBrakes; they slow you down for the landing where guides will be waiting to assist. The brief walks between the sections are all downhill. 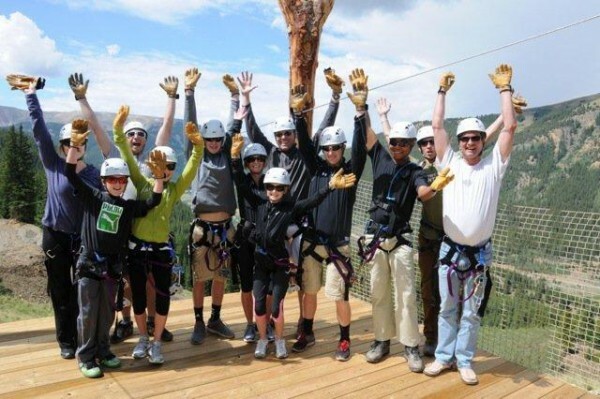 Our Zip Line is registered with the State of Colorado. At the end of the tour, guests will return to Base Camp in a Shuttle. All lines are between 10,000′ and 11,500′ of altitude. It’s always cool and comfortable in our high back-country area. Tour Time: Check in no later than 11:30am for the 12:00pm tour.